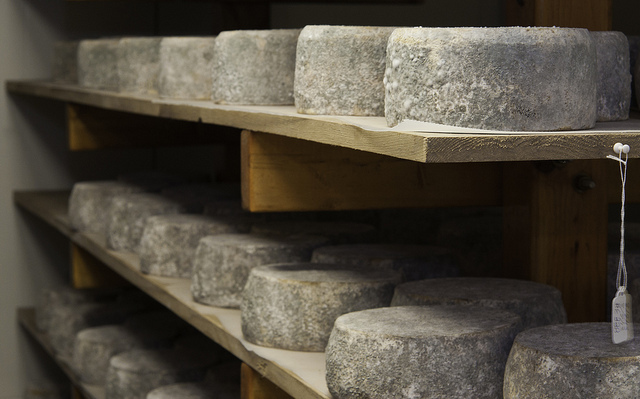 VAPG grants can be used to make value-added products like these “Blue Bay” cheese rounds from Easton, MD. Photo credit: USDA. Editor’s note: Following the publication of this blog post, NSAC released its updated Farmers’ Guide to Applying for the Value-Added Producer Grant Program. The Guide is a free resource that walks farmers through the program’s application requirements, including a step-by-step description of the application and ranking processes. Whether helping farmers turn organic grains into shelf-ready items or providing capital for the creation of farm-identity preserved regional supply chains, the Value-Added Producer Grant (VAPG) program has served as a valuable resource for farmers looking to grow their businesses through value-added products. Today, April 8, the U.S. Department of Agriculture announced the availability of $44 million in funding through the competitive VAPG Program. Of the $44 million, $10.75 million comes from the fiscal year (FY) 2016 Consolidated Appropriations Act, while $30.25 million comes from the 2014 Farm Bill. Another $3 million is available as carry over money from previous years. Administered by USDA Rural Development, the VAPG program provides competitive grants to producers for working capital, feasibility studies, business plans, and marketing efforts to establish viable value-added businesses. Up to $75,000 is available for planning grants and up to $250,000 is available for implementation grants. We encourage all readers to help get the word out to qualified individuals and groups, which will help to ensure a strong applicant pool. The deadline to submit paper applications is July 1, while electronic applications are due June 24 through grants.gov. Individual and groups of producers, as well as farmer coops and producer-controlled businesses, are eligible to apply for these grants, which help to increase income and marketing opportunities for America’s farmers and ranchers, along with fishermen, loggers, and other harvesters of agricultural commodities. USDA has created a “toolkit” for applicants, that includes an application checklist, templates, required grant forms, and instructions (found under the “Forms & Resources” tab). NSAC and the USDA partnered on a webinar for prospective applicants on May 8, a recording of that webinar can be found here. The National Sustainable Agriculture Coalition (NSAC) has released an updated version of its annual Farmers Guide to the VAPG Program, a unique resource that walks farmers through the program’s application requirements, including a step-by-step description of the application and ranking processes. While we are pleased that the Notice of Solicitation of Applications (NOSA) has been published earlier this year than in previous years, timing continues to be a major problem for VAPG. Farmers and farm organizations have requested that USDA run the application process during the winter, when farmers are less busy and have more time to put together applications. Though USDA officials have repeatedly stated that this is their intent, the application cycle timing has remained unpredictable and often delayed, with no cycle to date being issued in the winter months of the assigned fiscal year. Concerned by the delays, Representative Chellie Pingree (D-ME) recently raised this issue in hearings with USDA officials. In addition to problems with timing, the National Sustainable Agriculture Coalition (NSAC) is concerned that the large allocation this fiscal year will leave too little money for the final years of the 2014 Farm Bill cycle. The $44 million funding opportunity, the largest single-year award allocation in the program’s history, represents a boon for producers who are able to put forward proposals this year, but could leave future applicants out in the cold. This year’s allocation includes half of the program’s 2014 Farm Bill mandatory funding – funding that was intended to last through the entire five-year farm bill cycle. Releasing half of the total 2014 Farm Bill money in just one funding cycle curtails the program’s ability to support farmers in developing value-added enterprises in future years. We wholeheartedly support VAPG, a program which we have championed since its inception, but are disappointed in the decision to spend the majority of funds in a single grant round, leaving 2017 and 2018 shortchanged. We will continue to urge USDA to adopt strategies that ensure sound management and program effectiveness. Perhaps most concerning for NSAC, the FY 2016 NOSA follows the recently released VAPG rule in severely weakening farm bill priorities for beginning farmers, decreasing the program’s utility in helping to create strong, viable new farming opportunities. This NOSA conforms to changes in the rule that subtract priority points for applicants who are not groups, businesses, or cooperatives. It even reduces the number of points a proposal receives for addressing the program priorities, while also making the rules for gaining those limited points more complex. Moreover, the rule allows program priorities to be overridden by discretionary points, which the agency can use to promote the goals of the Administration. Under the FY 2015 notice, USDA awarded two priority ranking points if at least 75 percent of a group applicant was made up of one or more of the following priority categories: (1) small- and medium-sized family farms and ranches, (2) beginning farmers or ranchers, (3) socially disadvantaged farmers or ranchers, and (4) veteran farmers or ranchers. For FY 2016, this number is 50 percent. While a 50 percent threshold for receiving two priority points is preferable to a 75 percent threshold, the bigger problem is that very few if any groups qualify for any of the five available priority ranking points because very few are majority controlled by beginners, socially disadvantaged producers, or veterans. In recent years, it has become quite clear that this priority will remain meaningless until the 50 percent floor for groups is significantly lowered. The purpose of the priority is to help producers that have been traditionally underserved, such as veterans and minority producers. Group projects that provide a substantial benefit for these producers could easily come from a group that has a third or even a quarter of its membership coming from the targeted priority group. We will continue to urge USDA to modify the 50 percent requirement. Equally problematic, is that in order to compete in separate, smaller applicant pools (which are set aside specifically for beginning farmers, socially disadvantaged farmers, and farmers or ranchers proposing development of Mid-Tier Value Chains), every single member of an applying group must be from one of the priority categories listed above. Very few, if any, groups are able to meet this requirement. Finally, the VAPG proposal review process continues to be cause for major concern. USDA requires only one internal USDA reviewer and one external third party expert reviewer. This differs from the process used by nearly every other USDA competitive grants program, which uses an external review panel. These panels are either convened in person or, if panelists must be remote, work separately but in dialogue. NSAC continues to push for reasonable changes that would make the VAPG review process more transparent and more collaborative. NSAC helped create VAPG as part of the 2000 Agricultural Risk Protection Act. We subsequently fought to expand and strengthen the program as part of the 2002 Farm Bill, and were successful in having organic products and sustainable livestock niche markets included in the program. As part of 2008 Farm Bill negotiations, NSAC campaigned for improvements including a consideration of local food enterprises and food supply networks linking farm to table. We also succeeded in getting program priorities for assisting small and mid-size family farms, as well as for beginning and socially disadvantaged farmers and ranchers. In the 2014 Farm Bill, NSAC successfully campaigned to have Congress clarify how program priorities were to be assessed, and also won the addition of returning veteran farmers as a new program priority category. For FY 2017, NSAC is working to secure $15 million in discretionary funding for VAPG. This will be particularly important for future applicants to the program given USDA’s short-sighted decision to spend most of the remaining farm bill money in FY 2016. Read more about NSAC’s involvement with the FY 2017 Budget and Appropriations process here.